Now that 2009 has ended, it seems that everybody and their moms are coming up with “best of the decade” lists, whether it’s sports, movies or games. We’ve got some ideas of our own regarding this, though we’re letting things marinate like a juicy steak before we let you dudes start biting into it. OK, that analogy got a tad weird at the end. Anyway, the A.V. Club has posted what it believes to be the best games of the 00’s, and as such has listed 15 games that progressed the medium. The list is actually remarkably well put together, and includes some great titles that you honestly don’t see in too many places, such as Advance Wars for the DS and Katamari Damacy. While I’m not the hugest fan of Bioshock as the number 1 title, I can see why so many hold it in high esteem, though it seems a bit repetitive to include it along with Fallout 3. Aren’t they largely similar? Feel free to flame me if I’m wrong, as I couldn’t really finish either. What do you think of this list, and what’s your game of the decade? Go! Well, I’m on your mom’s top 10 of the decade, so, you know…there’s that. Yeah, can’t really say I can complain about the list. I mean, no Halo is still strange to me, but I’ve never played any of the ones that I don’t think belong (Ninja Gaiden, Katamari). Shame on you for not finishing Fallout. You will never see the biggest cop-out in gaming history. Bioshock similar to Fallout 3? 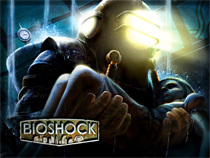 Nay Nay Nay… I couldn’t finish Bioshock either… There was just something about it that wasn’t for me, but I say I love it, because it was beautifully made. Fallout 3 on the other hand I couldn’t stop playing. Deus Ex came out in 2000… sooo thats my #1 game of the decade! Fallout 3 and Bioshock were nothing alike, and I have finished each. For starters, Bioshock is hardly an RPG, and that’s stretching it if you even consider your plasmids and tonics RPG elements. The games’ mechanics are faaaaar different. Hell, even the way you switch weapons is extremely different. Each also has its own unique story and characters. On top of everything else, Fallout 3 is free-roaming and Bioshock has levels. The two are so spectacularly different I could go on for hours, but I’ll stop here as not to bore you. I do largely agree with the list, especially on the placement of Bioshock. I truly think it deserves its position. The game really was something else, and if you actually played it all the way through it was extremely rewarding. Eddy, I am ashamed. Fallout 3 and Bioshock are nothing alike! Go to your room, young man! This list was pretty good… except i don’t really see how Bioshock advanced the medium. Don’t get me wrong i love the game but it didn’t really change a lot did it? This would read better as “Most Influential Games of the Decade.” I read AV Club daily and their videogame coverage has improved vastly over a few years (except for the addition of Leigh Alexander as a reviewer), and this list does them justice, but I still think it should read “Most Influential”. I mean, Ico was amazing, but SotC was better. Ico, however, was revolutionary. I’m not a fan of GTA, but if it was best, GTA IV would be there instead of Vice City. In that light, I would have put Guitar Hero 2 instead of Rock Band, and WoW (even though I don’t play) would sit at #1. Next Next post: GamerSushi Community Game: XBox 360!